FOTOFILMIC17 is the 5th edition of the FotoFilmic International Traveling Exhibition Competition, world’s only global scale call for contemporary material photography presenting a unique and challenging worldview of 21st C. photographic arts rooted in analog, historical and film-based practices. 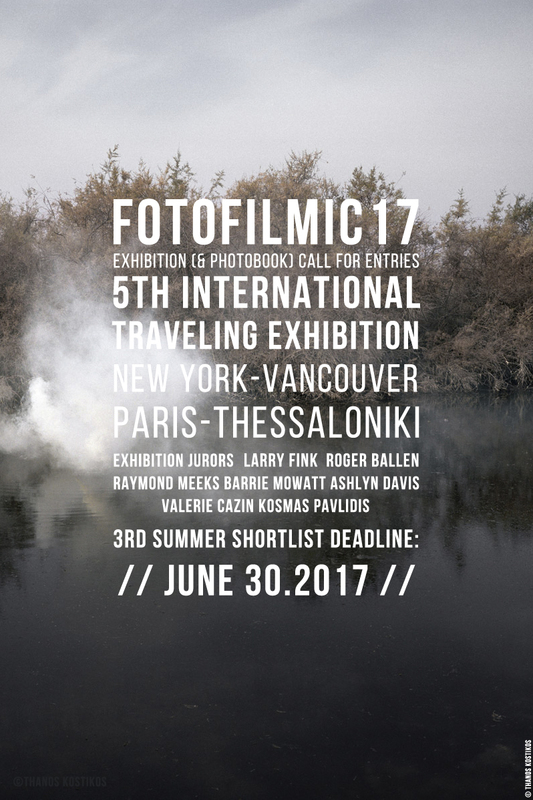 With the first 30 WINTER SHORTLIST winners as well as the second 30 SPRING SHORTLIST winners now announced and published the 3RD FINAL FOTOFILMIC17 SUMMER Call is accepting film-based and analog photography & photo book entries until JUNE 30. The FotoFilmic17 Traveling Exhibition’s roll-back-in-time itinerary will take its 30 laureates across 4 world cities spanning the New World and the Old Continent from the west coast shores of Vancouver, Canada to New England’s Empire City New York, then across the Atlantic to the City of Lights Paris, France, and deep to the historical heart of Europe to Thessaloniki, Greece. REQUIREMENTS All photographs and books submitted must have been integrally shot either on film in any format or captured analogically (no digital capture). This is an open theme call and submitters can enter up to 10 images (individual images or series) and 1 Photo Book per entry. - Exhibition Catalog Publication (all 30 exhibitors) Not eligible to enter? - Find contest where you are. COPYRIGHT: All works entered must be the photographer’s own. Entrants also guarantee that all copyrights corresponding to the work submitted in their name are theirs, or that in the case copyrights have been ceded to a third party they have effectively obtained express authorization from the third party to use their imagery for the purpose of being exhibited and published as part of FotoFilmic17. Entrants certify that they have received in written form appropriate release from all models and persons featured in the work they enter regarding possible commercial uses. USAGE RIGHTS: By submitting work to the FotoFilmic17 International Traveling Exhibition and its SHORTLIST Calls, photographers also agree to the restricted use of their imagery for promotional purposes in relation to FotoFilmic17 online publications as well as printed marketing materials.